Bella Italia: a country of pasta, passion, and culture. Enjoy this gift box with Italian specialties, close your eyes and imagine yourself - just for a moment - in the beautiful Italian countryside. From the extensive orchards with olive trees to the maze of small alleys buzzing with life, Italy has so much to offer in terms of culture and nature, which is reflected in Italian cuisine. 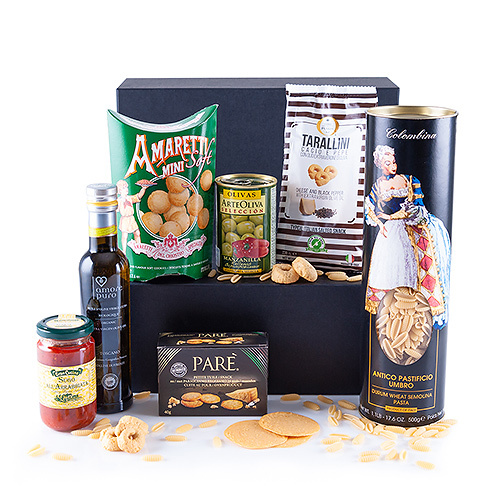 This stylish gift box offers a delicious assortment of top quality Italian products to enjoy the tastes of Italy. Discover the elegant tube with Gnocchi "Colombina" - the woman on the pasta box is a well-known Italian theater figure. The Mini Amaretti are delicious, soft cookies with Amaretto flavor. Enjoy a delicious aperitif with olives filled with bell pepper, tarallini cheese biscuits with black pepper, and cheese crackers with Parmesan cheese. We finish big with a bottle of extra virgin olive oil from Tuscany and the delicious Arrabbiata tomato sauce from Gran Cucina.